Blue Mountain is Ontario’s largest mountain holiday resort, nestled beneath the beautiful Niagara Escarpment on the shores of Georgian Bay, around 90 minutes north of Toronto. 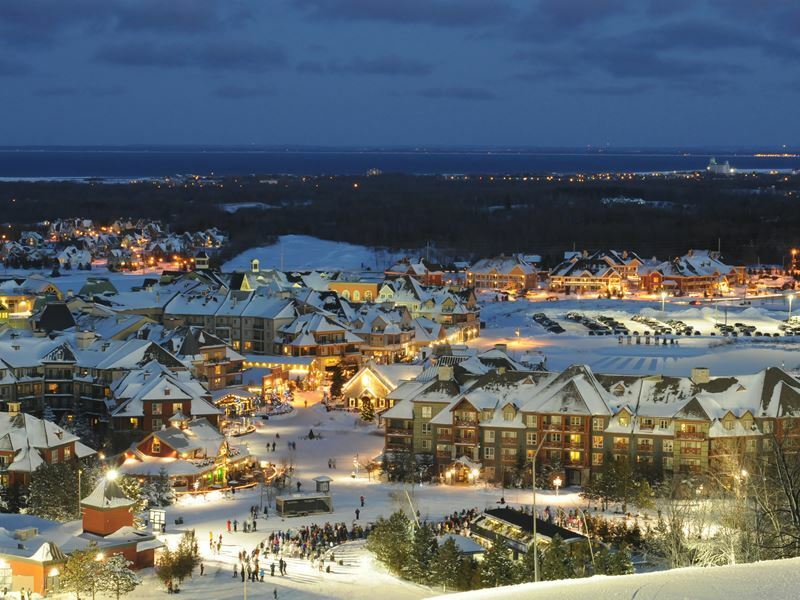 Whilst it’s primarily known for its skiing, Blue Mountain is very much a four-season destination, open year-round and boasting a truly mind-boggling range of activities no matter what month you visit. 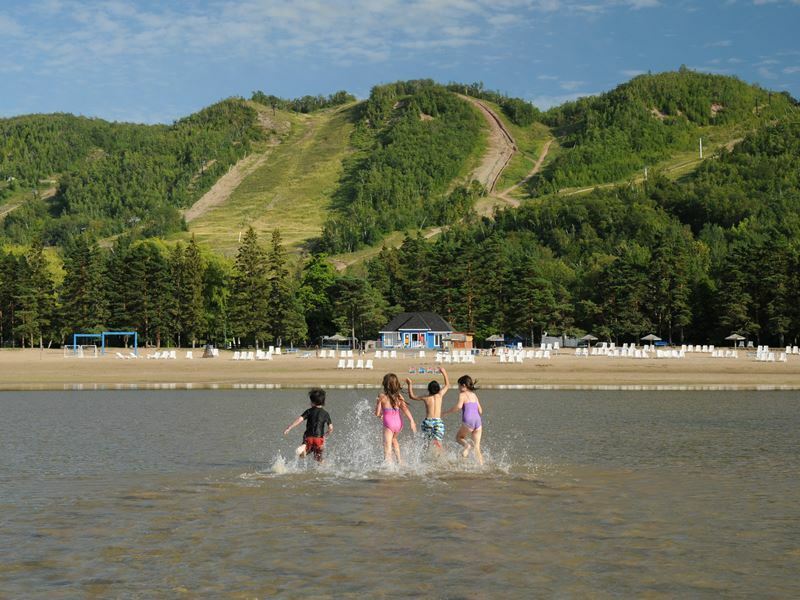 The resort is also very much family-focused and continually ranks among the top child-friendly holiday villages in Canada. Summer is a particularly popular time to visit, with the warm weather opening up a fantastic array of outdoor pursuits guaranteed to keep the whole family happy. Opportunities for soft adventure and relaxation abound, from scenic hikes to gondola rides, downhill biking to championship golfing, Scandinavian baths to culinary indulgence. 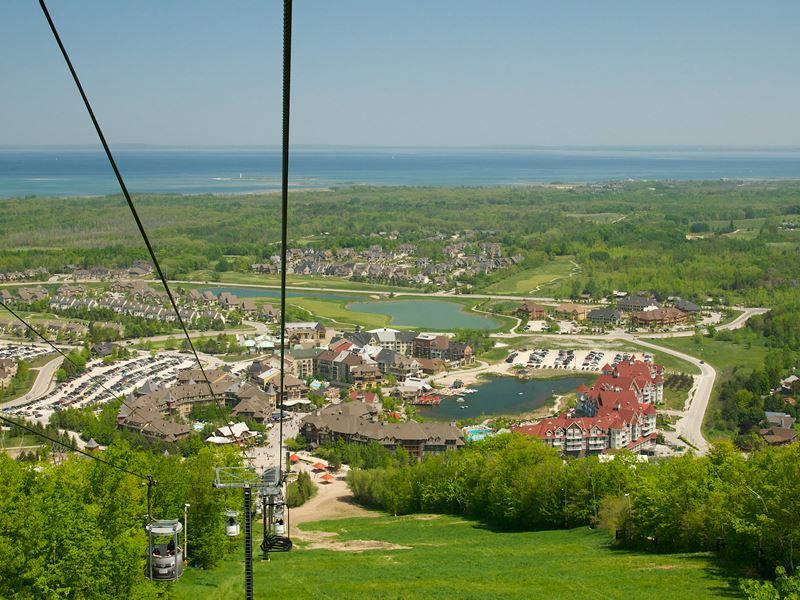 The open air gondola provides the perfect introduction to the resort. Take a ride up the mountain to get the lay of the land and enjoy outstanding panoramic views over the surrounding hills and coastline. Up top, you can make use of several picnic areas and scenic lookouts for snapping some great shots and soaking in the wonderful setting. The gondola is also the ideal way to access more activities out in nature, without first having to scale the mountain, including biking, cave exploration and hiking. Blue Mountain is home to four fantastic hiking trails, including a couple suitable for families with young children and other more rugged routes designed for seasoned hikers. All wind through the Niagara Escarpment, a UNESCO World Biosphere Reserve, taking in impressive vistas along the way. Some stay up high, making the most of the scenery, whilst others provide a link between the base and top of the Escarpment, involving steep terrain and requiring more stamina to tackle. Remember to bring a picnic and camera and to make use of the free gondola ride back down to the village! For a more easy-going alternative to hiking, but one that still enables you to get out into nature and appreciate the stunning surrounds, join a Segway tour from the top of Blue Mountain. Accompanied by a trained guide, you’ll cover more ground in less time, stopping off at some of the best lookout points for breath-taking views over the resort, hillsides and bay. Just a short distance from the resort lie a set of impressive glacier-carved caves which are connected by nature trails along the Niagara Escarpment. Check out the chilly Refrigerator Cave, squeeze through tight gaps in the rocks and brave the wobbly suspension bridge. For those wanting more thrills, guided caving tours offer the chance to explore the hidden crevices that dot the escarpment in more depth. For a truly unforgettable way to witness the full beauty of the landscape, take to the air for a scenic helicopter tour. 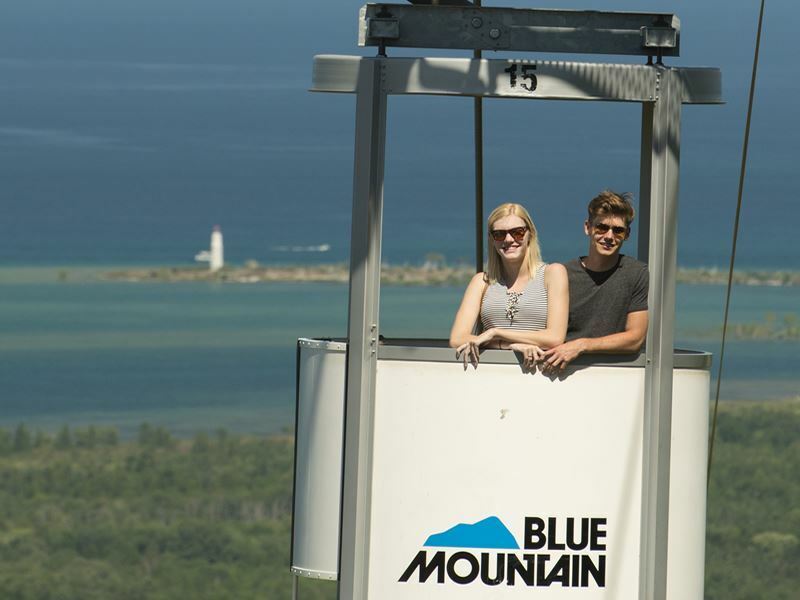 Accompanied by a knowledge guide, you’ll be treated to a mind-blowing bird’s eye perspective over Blue Mountain and several areas along Georgian Bay. It may surprise you that a resort primarily known for its winter sports is also home to a sandy beach, but a mere 10 minute drive will deliver you to an attractive stretch of sand along the pristine shores of Georgian Bay. You’ll find plenty of rentals and activities on offer to keep the family occupied, including volleyball, badminton, stand-up paddle boarding, soccer, kayaking and even yoga. Or you may prefer to simply enjoy a relaxing swim in the warm water, sit back on a lounger in the sun, or treat yourself to a refreshing cocktail at the beach club. The nearby Beaver River is a gentle waterway that’s perfect for honing your paddling skills in a canoe or kayak, as well offering fabulous views of the Niagara Escarpment. Alternatively, young families can enjoy taking a boat out onto Mill Pond – a tranquil body of water found right in the heart of the village and home to a wealth of intriguing wildlife, including fish, frogs, insects and birds. This predominately indoor aquatic centre is the perfect place to take the kids to blow off some steam on a rainy day. They’ll be occupied for hours with splashing around in the multiple pools and playgrounds, decked out with water slides, rope swings and docks. Meanwhile, adults can join in with the water games or enjoy soaking in the hot tubs. 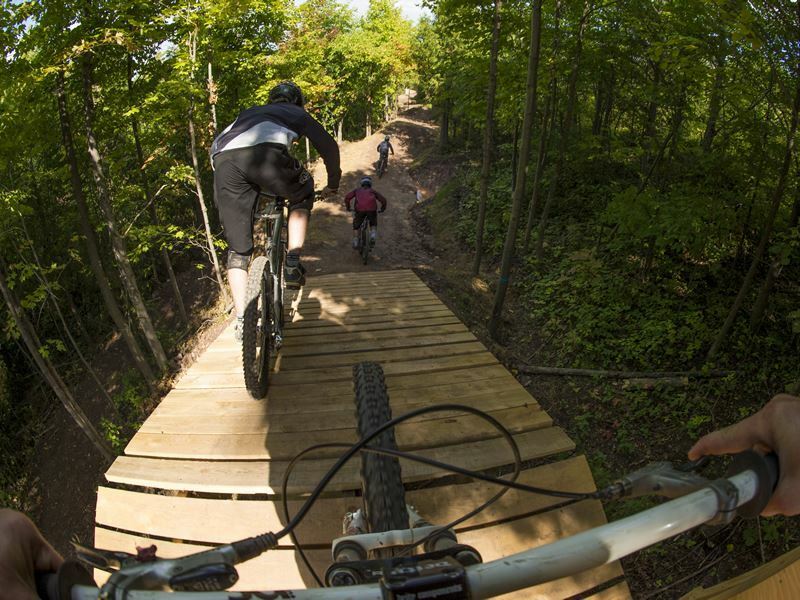 Blue Mountain is home to some of the best downhill riding in Ontario. The bike park features 23 trails with something to satisfy all tastes and skill levels, from gentle cross-country excursions, to flowing singletrack and challenging technical descents. Lift access to the top of trailheads, along with rental equipment, lessons and season passes are all available. The 2016 season was marked by some highly anticipated park upgrades and expansions, so the scene is all set to hit the saddle this coming summer. The resort’s numerous air-borne activities are guaranteed to satisfy thrill-seekers of all ages. Budding climbers can test their strength and agility on the resort’s fully-supervised climbing wall, or head out for a taste of the real thing by scaling a natural rock face in a guided outdoor environment. 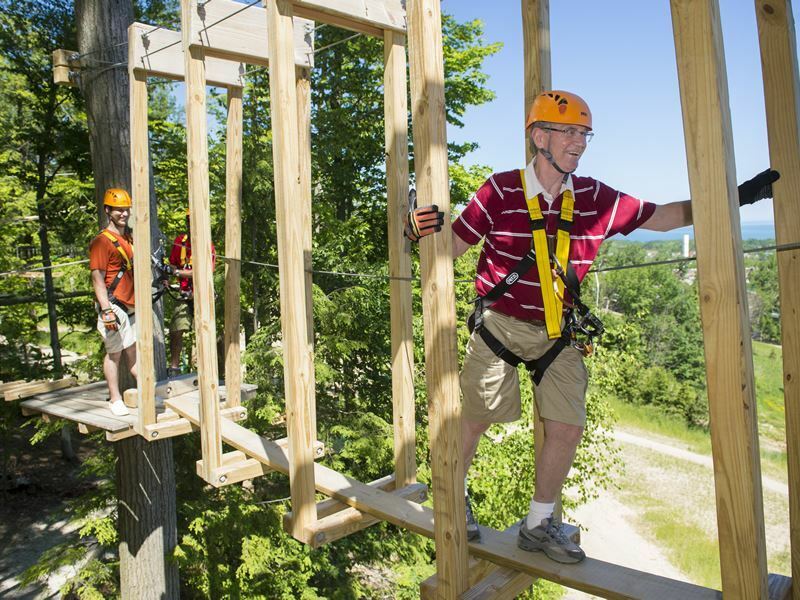 You can also cruise down zip lines, negotiate high rope courses, and even free-fall from 21 feet onto a huge airbag. All these aerial adventures and more, provide a wonderful perspective on the natural surrounds as well as delivering the ultimate heart-pounding adrenaline rush! Come wintertime, Blue Mountain transforms into a snowy wonderland and a whole new world of adventure opens up. This is Canada’s third busiest ski resort, boasting the largest skiable area in Ontario, spanning 364 acres across 42 trails. You’ll be treated to freshly groomed slopes, plenty of powder and some of the best riding in the country. 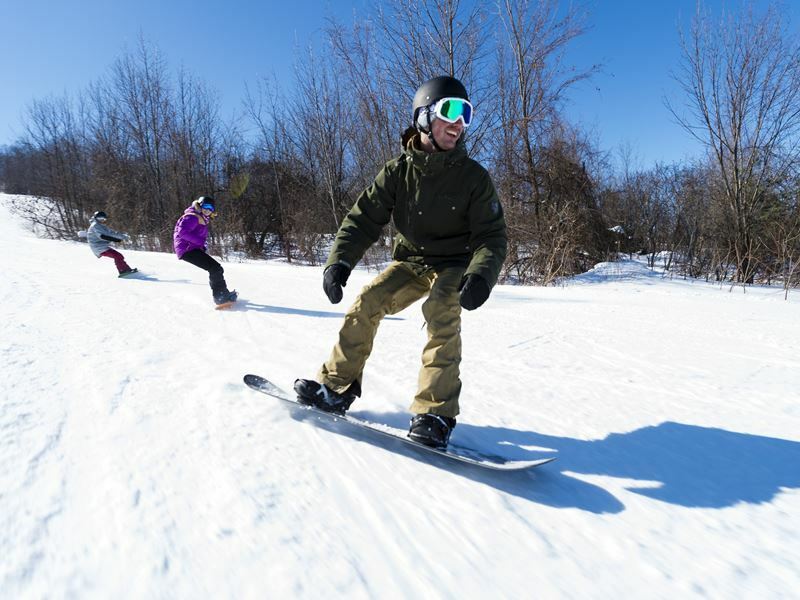 The resort is especially great for first-timers, featuring plenty of beginner slopes and a Snow School which provides a great selection of programs and lessons to suit every skill level. Meanwhile, seasoned veterans and adrenaline junkies won’t want to skip the free-style terrain parks, complete with rails, boxes, half pipe and an epic jump line. Additional winter resort features include high-speed chairlifts, a world-class snow-making system that ensures slopes remain in peak condition all season long, as well as spot-lit night riding on selected trails. Other fun-filled adventures to be had in the snow include snowshoeing through the magical backcountry, free ice skating on Mill Pond – which transforms into one of the largest outdoor ice rinks in the region - as well as snow tubing, which provides a wonderful family-friendly introduction to the slopes. Blue Mountain is home to Monterra, one of Ontario’s most famed, challenging and rewarding golf courses. It attracts enthusiasts from around the world keen to test their skills on its championship holes and rolling bent grass fairways. Along the way, there are ravines, creeks, lakes and no less than 86 bunkers to navigate. Highlights include the memorable mountain scenery and the chance to play some spectacular elevated tee shots. There’s also a full-service golf shop, practice area, on-course sanctuary, bar and deli to enjoy. For something a little less challenging, but no less fun, stop by the Cascade putting course. 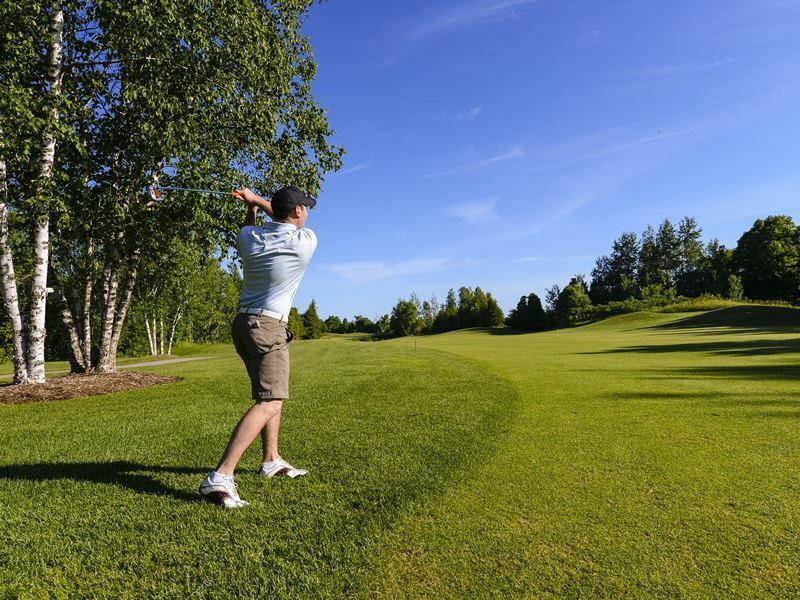 Featuring 18 holes, with plenty of surprises along the way, not to mention panoramic views of the Niagara Escarpment, it’s the perfect way to enjoy quality time with the whole family. After a long day spent out in nature, entertaining the kids, or negotiating the hustle and bustle of the village, there’s nothing quite like retiring to a rejuvenating spa to replenish those batteries. 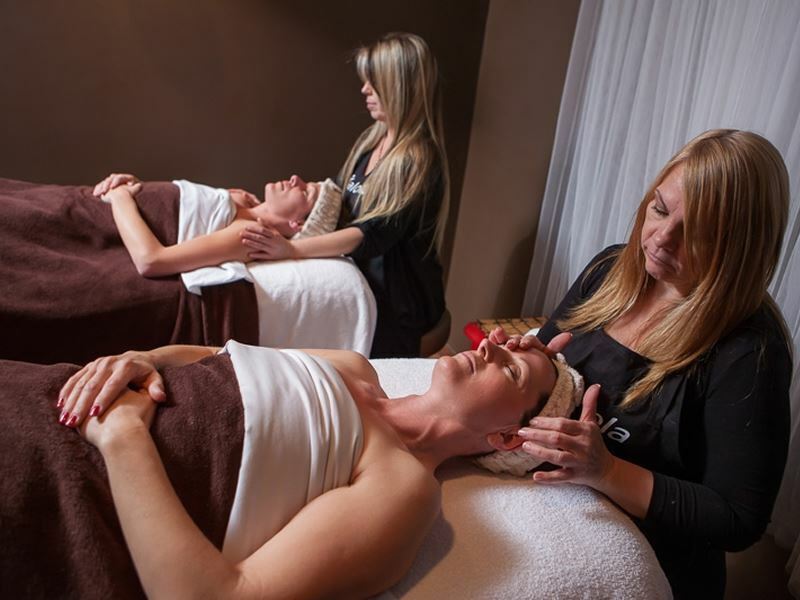 Luckily, Blue Mountain has four fantastic spas for those wanting to take it easy. Top of the bunch is the renowned Scandinave Spa. This award-winning venue is set in the midst of a lush forest. just a short distance from Blue Mountain, and features an inviting collection of hot and cool pools, along with thermal waterfalls, relaxation areas, a Finnish sauna and eucalyptus steam room. Combine with a heavenly 60-minute Swedish massage and a stop by the onsite health-conscious bistro, and you’ll be raring for your next adventure in no time. For those in need of some retail therapy, the pedestrian village is home to a superb range of stores, especially for a community of its size. There’s something to appeal to all ages and tastes, whether it be the latest outdoor gear and gadgets, quirky home accessories, elegant furniture, kid’s toys or trendy fashion items. Top picks include Lifted and Colombia for adventure apparel and sports equipment, Go Fish Go and The Olde Stanton Store for unique homeware and gifts, along with Brights’ Gallery and even a paint-your-own pottery store for art lovers. Foodies won’t be disappointed by the fantastic array of dining options to be found in and around the resort. Whether you’re after a quick bite to eat, a fun family meal or a romantic dinner with drinks, there’s something to suit every occasion. For tasty snacks perfect for refuelling after a day of adventure, Hatley Scoops offer delicious ice-cream, whilst the renowned BeaverTails serve up an enticing selection of decadent pastries. Other options to tempt the taste buds include sushi, poutine, pitas, frozen yogurt and hand-crafted chocolates. Oliver & Bonacini and Pottery Restaurant are both great options for classic Canadian comfort food, with signature dishes including mouth-watering burgers, seared scallops and succulent ribs. For international fare be sure to check out firm favourite, Firehall Pizza Co. Designed to look like a Northern Ontario Firehall, the food and décor is always a big hit with the kids. Alternatively, Tholos offers an exciting take on Greek cuisine, including a flaming Saganaki (goat cheese) appetiser which is flambeed at your table. Blue Mountain is also features some lively après spots for those wanting to enjoy a round of drinks and live entertainment in friendly surrounds. Jozo’s Bar is a favourite with the ski crowd, but remains open year round and is a great place to watch the game or sit back with a drink and enjoy the lively atmosphere. It serves up quality pub grub, great beer and has specials, events and promotions on selected nights. Rusty’s offers an inspired cocktail menu in a fun and cosy atmosphere, along with a picturesque patio that’s a real hot spot in summer. For something a little different, SMASH is a ping pong club decked out with four Olympic size tables, giant projector screens, along with an extensive beverage and snack menu. After 10pm, the venue transforms into a dancefloor featuring top hits played by some of Canada’s top DJ’s.